Tungsten carbide, which is often just called tungsten, and titanium are the most popular materials for contemporary jewelry, and, in particular, rings. While some people believe there aren’t many differences between the two metals, there are some definite differences to consider when making your choice between tungsten and titanium. After reading this list, you’ll be able to see that it comes down to the person’s lifestyle when trying to make a choice between tungsten and titanium. When it comes to the Mohs Scale of Hardness, the very hardest material known to man is diamond, which most people know. What they might not know is that tungsten comes in second on that list. Where diamonds have a hardness of 10, tungsten carbide is a 9 on the scale. Titanium is further down on the list at a 6 hardness. To put it into perspective, stainless steel, your tooth and palladium are only one step lower than titanium at a 5 on the list. Titanium and tungsten are both mixed with other alloys when used in jewelry. Titanium is normally 85% pure, but mixed with aluminum and vanadium to make up that extra 15% for jewelry. Tungsten carbide jewelry is made of an equal amount of tungsten and carbon atoms or cobalt. Below we’ve shared with you a video about the making of a titanium wedding band which we think is very educational if you’re looking to learn more about that particular metal. There’s no question that the hardness of tungsten makes it a clear winner in terms of scratch resistance. The only material that can cause a scratch on tungsten is diamond itself. There are plenty of materials that can scratch titanium. The hardness of tungsten means it’s more naturally brittle. It can be cracked or chatter under the right conditions. Ceramic is one material that can certainly shatter tungsten. Titanium rings are more crack-resistant, so while they’ll scratch sooner than tungsten, they’re good for people who work with their hands. Both metals are incredibly affordable and cost less than other expensive precious metals like gold. It’s hard to put a standard price on the metals because much depends on the style, quality of the material, and the manufacturer of the jewelry. While some can be incredibly affordable, others can be expensive. The gemstone in the jewelry will make a huge difference in the price too. In other areas, like price, titanium and tungsten are quite similar. The weight of these two metals is very far apart. Tungsten is a weightier metal than titanium. Many men who don’t like to wear rings will enjoy the weightlessness of the titanium ring compared to the solid feel of the tungsten ring. Here is a video which illustrates the pros and cons of tungsten rings. 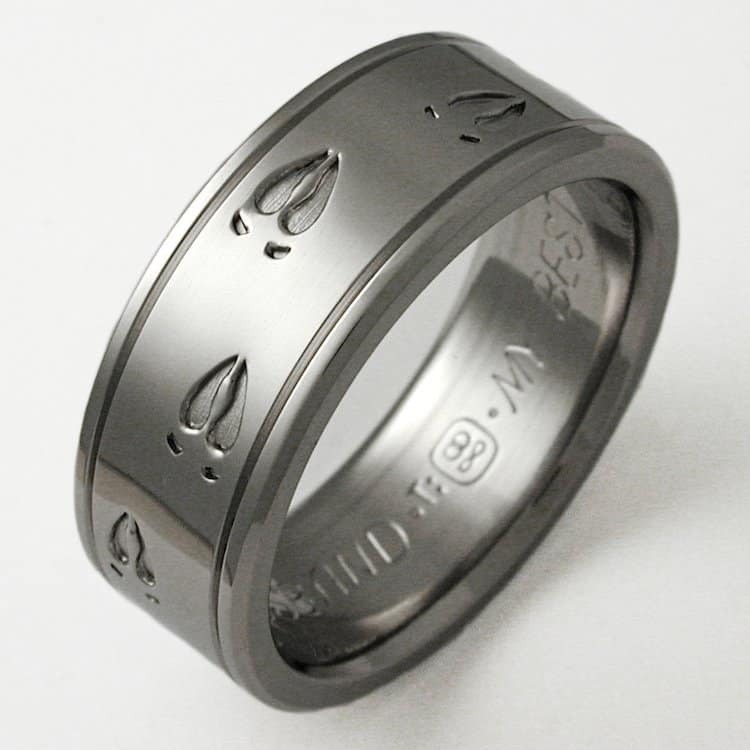 Can the Titanium or Tungsten Ring be Resized? The metals are the same in that they can’t be resized. Any resizing will result in the ring breaking. With the inexpensive costs of the metals, though, the rings can easily be replaced if they need to be resized. There are also some manufacturers that allow customers to return a ring for a different size without charge. The metals are available in a variety of colors. They’re naturally darkish-gray, but they’re seen commonly in black as well. 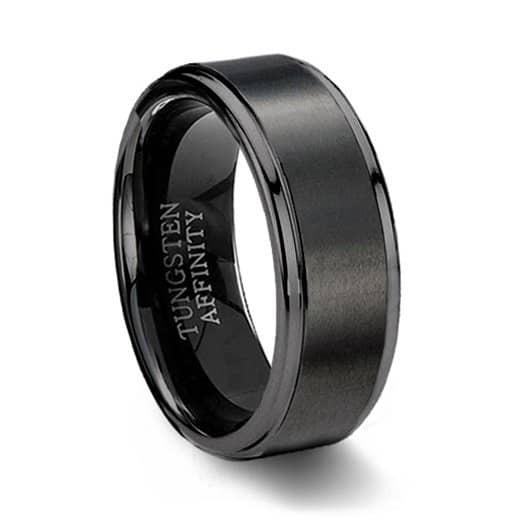 Tungsten has the option of being a white that gives a more classic white gold or platinum look to the jewelry. Titanium can be created in a variety of colors. It goes through a heating or oxidation process that can produce blue, purple or black. 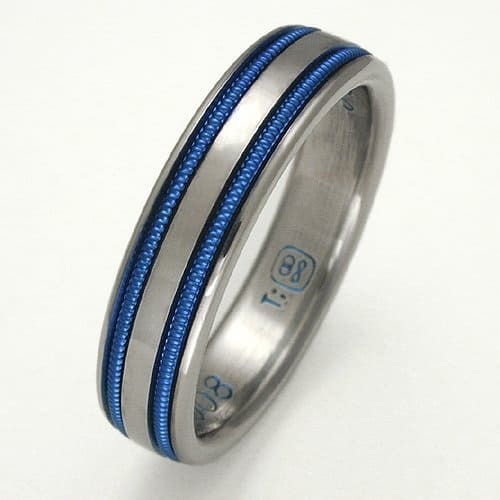 The color in a titanium ring doesn’t penetrate completely and can be scratched off the ring itself. When it comes to titanium rings, people who are prone to allergic reactions to metals will not have a problem. The same can’t be said for tungsten rings, which have elements in them that will cause skin allergies. The allergy is often caused by cobalt, so if a piece of jewelry says that it’s specifically not made with cobalt, the person might not have an issue. It depends on the alloy used. People often hear that rings made of titanium or tungsten carbide can’t be removed in case of emergency. That’s a myth that isn’t true. They can both be taken off in an emergency using different methods. For example, titanium rings need a jeweler’s saw for removal. Tungsten carbide rings have to be removed using pliers to crack the ring. 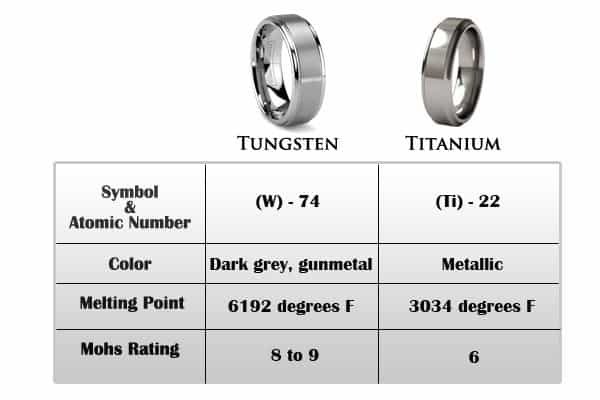 When it comes to a comparison of tungsten vs titanium, the two metals are very different. They have a few similarities, but overall, the differences are overwhelmingly clear. Titanium is a lighter metal that can take a beating, but might get scratched in the process. Tungsten is a weightier metal that can resist scratches, but will break if enough pressure is applied. If you’re trying to decide which metal to choose, consider the person’s lifestyle for the answers.